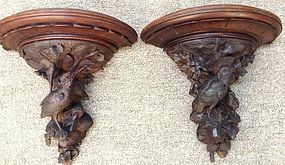 Amazing pair of antique black forest carved wall sconces. Hand carved heavy walnut with incredible intricacy. Birds, leaves and scalloping. 14" tall, 8" deep. Couple missing pieces, but very complete. Excellent condition for age and detail.